IMAGE: Mayo is famous for the Great Western Greenway, so-far seen as the most successful of such routes in the country, but there has been resistance to build a greenway on a disused section of the Western Railway Corridor, which remains in state ownership. Campaigners for a greenway on the disused Western Railway Corridor between Galway and Sligo via Mayo have said that a planned tourism Velorail project — where pedal-power carts run on the existing tracks — is the perfect change to start building a walking and cycle route. A petition on Change.org, which is due to close tomorrow (Monday), is calling on Mayo County Council to install a walking and cycling path along side the planned 13km Velorail project in Kiltimagh, Co Mayo. IMAGE: The old railway station in Kiltimagh (Google Street View). 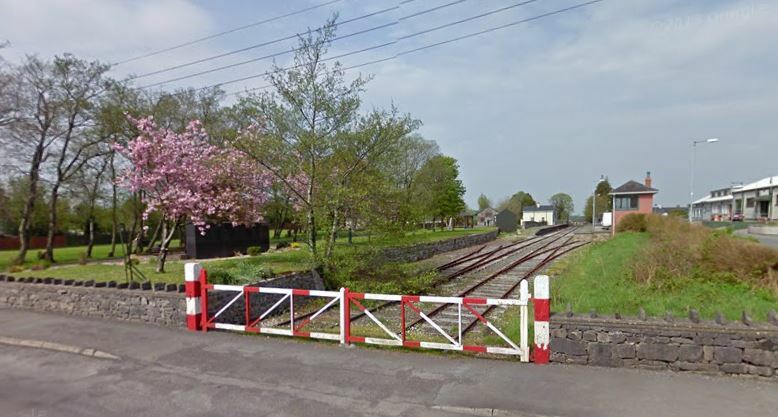 Railway campaigners, West-on-Track, who wanted to keep the railway alignment clear for a possable reopening of the railway are long-standing objectors to the greenway proposals, and the majority of local politicians have to-date supported them. However, there seem to be little objection to the Velorail project. Last September, Minister of State and local TD, Michael Ring announced that the Government was giving the project €180,000 in funding. The greenway campaigners on the other hand point out the the railway alignment is already subjected to encroachment, including apparent use as gardens and for farming in rural areas, and for forecourts and other uses in urban areas. Damage has also been caused to the alignment and tracks, including a case of theft, some major subsidence, and road building. Over the last few years at Mayo County Council meetings, some councillors from the Westport area have argued that the county should take a protectionist approach to greenways and not expand much beyond the Great Western Greenway, which runs from Westport to Achill. Mayo County Council, however, has a plan for a network of greenways and it has started to build greenways near the towns of Castlebar and Ballina but there are few signs that these will be linked into a network anytime soon. But the Western Railway Corridor is not in the council’s plan for future greenways.